The lateral thoracic artery is also known as the external mammary artery. Lateral thoracic artery travels inferomedially throughout the inferior boundary of pectoralis minor towards the anterior side of serratus anterior. The lateral thoracic artery originates via the medial surface of the axillary artery, posterior towards the distal part of pectoralis minor. The lateral thoracic artery also triggers lateral mammary sections that twist around the lateral border of the pectoral is major muscle in order to extend towards the breast. 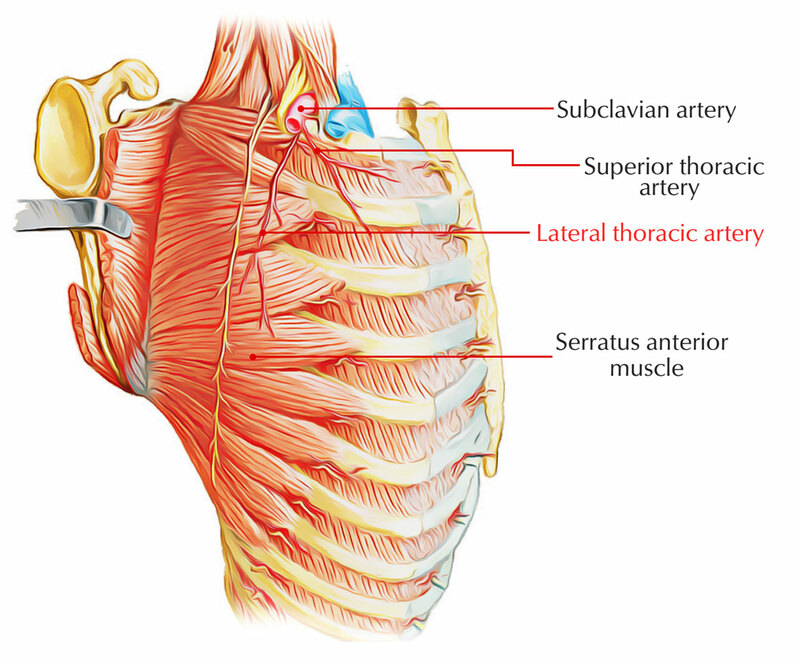 The lateral thoracic artery provides branches to the serratus anterior muscle, each of the pectoralis muscles, as well as the subscapularis muscle. Lateral thoracic artery anastomoses along with the internal thoracic and intercostal arteries and also with the superior thoracic artery. It circulates oxygenated blood towards lateral areas of the breast as well as upper thorax. Branching off via the axillary artery, the lateral thoracic tracks the pectoralis minor muscle’s lower boundary. Alongside the chest, it supplies the serratus anterior muscle. Women need a somewhat different circulation and volume of blood within their chests. This is due to the fact that women have a lot more detailed system of body tissue inside their breasts and mammary glands. In men, the area of the chest is primarily muscle tissue. Depending upon gender, there is a small anatomical diversification with the lateral thoracic artery as well as neighboring blood vessels.